649 Monsters is coming on Friday at 6PM. A lot of work has gone into this show. Mostly nights without sleep and eating... so if you're in Milwaukee - DO NOT MISS IT! Get cool artwork to hang on your walls and support a cool charity! All in 2 magical Pokémon inspired nights. Well, dudes, I've been home from Pokémon Nationals for a few days now and felt like it was time to capture my thoughts in an article. This was my first trip to Nationals and my first time meeting up with the rest of the Pokémon Podcast crew. My memory may not be the greatest, please forgive any inaccuracies, I will try to capture as many vignettes as possible. Keep in mind as well that I spent most of my time with Irene and Kidd, they will most likely show up more frequently in my tales. First off - the drive to Indianapolis from DC is horrible. Ten hours. The first four are through the western mountains of Maryland, Pennsylvania, and West Virginia. Then it is completely flat and boring through Ohio and Indiana. I was about seven and a half hours into the trip when I texted Irene and told her I was going to turn around and go home. I just couldn't take it anymore! I'm a big fan of GameTrailers.com's Mythbusters-esque show, Pop Fiction, and they've released a new Pokemon-themed episode! This time they're delving into the legend of MissingNo! What it is, what it does, and why it exists. Check it out! Hey guys. Here's our newest item in the store! Enjoy! This full-color playmat is printed on a smooth material with thick cushioned under-side that grips to most tables while game playing. 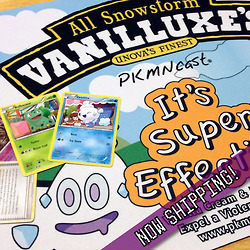 This Ice Cream inspired playmat is perfect for any TCG player. Sublimation Printing Soft Top, 1/16" Rubber Backed 14" x 24"Only 25 of these are being made. If you order before Friday the 22nd of June, you should get it before Nationals. Free Shipping USA. Please hit the "International" button to pay to ship the tube overseas. A while back, we shared a video from GameTrailers.com showing how to trick your Red Version or Blue Version cartridge into giving you a battle with a wild Mew, without the aid of a cheating device. Well, new information has come to light about exactly how and why it works. Check out the re-edited episode of GT's Pop-Fiction below! App Obtained! - "EV-Gear Free"
Heya guys, Kenny here with a neat app I found for the iPod and iPhone called "EV-Gear Free"! As we all know, EV training can be a bit tough, whether you're new to it or not. Learning how to EV train is hard enough, but keeping track of all of the EVs your current Pokémon can be kind of frusterating. That's where the app comes in; simply input your Pokémon and all of its information (Level, Nature, IVs, any EVs it may have obtained Pokérus stats, and the Brace it's currently holding) and 1... 2... Ta-daa! The app comes up with the stats you should be at! Furthermore, you can then choose an area you want to train at and keep track of how many IVs you have obtained. Say I have a Pokémon with 0 Sp.Atk EVs, a Power Lens, and Pokérus. Let us then say that I defeated a Litwick. I press the corresponding button on the app, and it's all calculated! It's a little hard to explain, so please check it out yourself! I really hope you guys get use out of this app. If you like it, make sure to give it a good review! I had some extra Pokémon stuff laying around, and I wanted to do a contest! All you have to do is leave a comment below about how you like our site (www.pkmncast.com). It doesn't matter where you live, anyone is eliglbe to enter this contest. Thats a ton of stuff for free! Only one comment below will count. You will have to sign up for an account in order to comment. Contest rules can change at anytime. Contest will end of Feburary 14th. Congrats to Alec Rose for winning this contest! And a huge thanks to everyone who took the time to enter!